According to a new report, one in three children in India have slow growth, while 15% of the country's population is undernourished. The 2016 Global Hunger Index (GHI) released on Tuesday stated 38% of Indian children under the age of 5, having stunted growth due to no availability of food. India was ranked 97 among the 118 countries, worst than all its neighbours China (29), Nepal (72), Myanmar (75), Sri Lanka (84) and Bangladesh (90), except for Pakistan (107) in measuring hunger, by the International Food Policy Research Institute (IFPRI). According to the report, hunger levels in developing countries have fallen 29% since 2000, and so efforts towards curbing hunger must be made in order to achive the international target to eradicate it by 203. Seven countries have "alarming" hunger levels, including Central African Republic (CAR), Chad and Zambia that have the worst levels according to the report. Haiti, that experienced the life taking Hurricane Matthew last week, and also a massive earthquake in the year 2010, ranks four in the index. The report also stated that another 43 countries which include India, Nigeria and Indonesia, have "serious" hunger levels. Considering the current rate of decline, more than 45 countries - including India, Pakistan, Haiti, Yemen, and Afghanistan will be having "moderate" to "alarming" hunger scores in the year 2030, according to the authors of the index. Shenggen Fan, director general of the Washington-based International Food Policy Research Institute (IFPRI) says,"Countries must accelerate the pace at which they are reducing hunger" in order to meet the 2030 target. The ranks in the hunger index are given considering factors such as undernourishment, child mortality, child wasting (low weight for height) and child stunting (low height for age). According to the report, nearly half the population in CAR and Zambia, and one in three people in Chad, are undernourished. 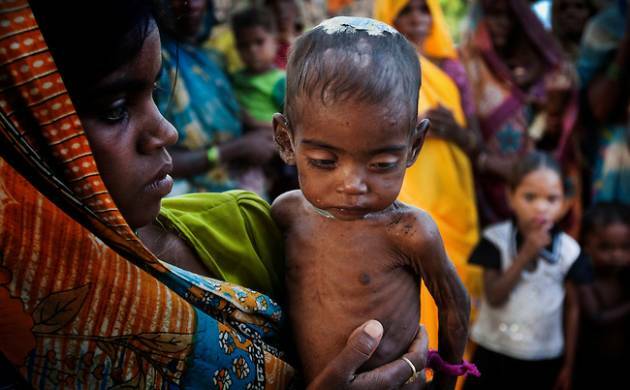 Highest hunger levels have been recorded in Sub-Saharan Africa, which is closely followed by South Asia. "Too many people are hungry today. There is a need for urgent, thoughtful and innovative action to ensure that no one ever goes hungry again," said David Nabarro, special adviser to the U.N. secretary-general on the SDGs. The report also marked improvement in 20 countries that succeeded in reducing their GHI scores by over 50% each since 2000. The 20 countries were Rwanda, Cambodia, and Myanmar.